During my childhood in The Netherlands, family, friends, dance & music (piano) played essential roles in my development and continue to be strong influences in my life. As a young woman I studied Occupational Therapy in Amsterdam and I have continued my professional practice in this field to the present time. I came to the USA as an adult (August 5th, 1981) and have permanently settled in the Triangle Area of North Carolina. While balancing the demands of a family and work I found quilting, which has gradually evolved into my artistic passion. 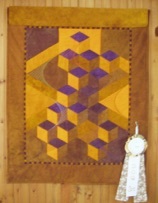 In 2002, I loaned a quilt “Solar Plexus” to the Art Center in Carrboro, NC to improve the sound quality in the theater at the time. 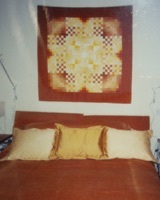 A couple attending a concert there in June 2002 phoned me, interested in knowing more about the creation of this quilt. After a lengthy conversation during which it seemed we’d known each other all our life, they purchased the quilt for their home (picture upper left). Needless to say I became a Quilt Artist overnight! Since then I have participated and won awards in a variety of textile shows and art galleries.